Walk In Greenhouse - Who Has The UK’s Best Walk In Greenhouse? 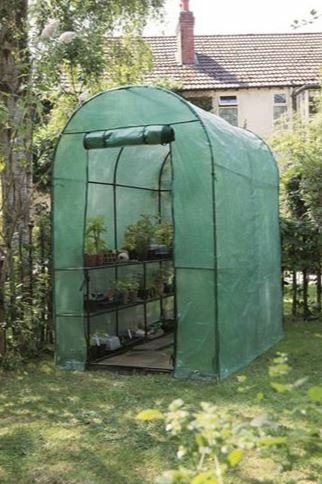 A walk in greenhouse is a very economical and flexible growing solution, in that they allow a gardener to protect, nurture and grow their plants whatever the weather, for a fraction of the price they would pay for a traditional wooden or plastic greenhouse. They’re also time saving, as well as money saving, devices as they can be erected and disassembled in a matter of minutes, and of course they bring the benefit of portability as well. So useful are they, that WhatShed have created this handy guide to reveal the best walk in greenhouse that can be bought online in the UK today. Whilst we didn’t have a large pool to choose from, we did find five high quality greenhouses worthy of a place in our league table. To rank them, we considered their price and value for money, as well as their build quality and growing capacity. 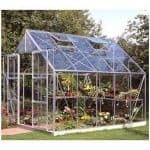 Whilst a walk in greenhouse is an excellent low cost alternative to traditional greenhouses, most of the ten leading online retailers of garden buildings concentrate purely on plastic and glass glazed models with a wooden or metal frame. That’s why some of the biggest names in garden building retail, such as Garden Buildings Direct and ShedStore fail to feature on this list. We were pleased, however, to find five that represent high quality construction and at the same time offer great value for money. This proved to be one of the most competitive of all our league tables, with all five models representing an excellent purchase. 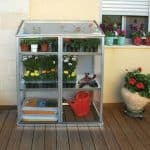 It’s very well done, then, to the compact five tier walk in greenhouse from Gardman. 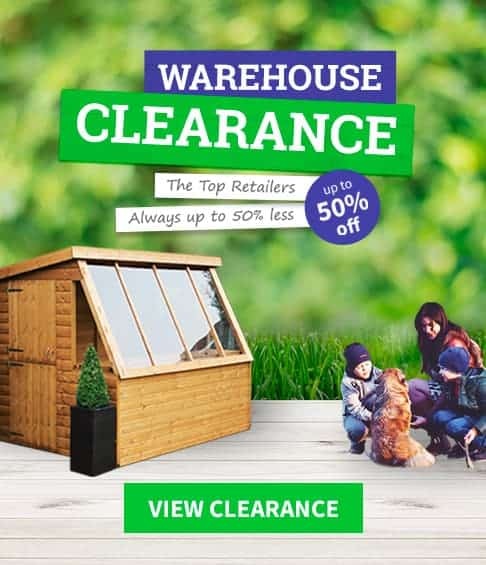 Thanks to its great value for money, attractive looks and five sets of shelving it gains the accolade of being named the best walk in greenhouse available to purchase online in the UK today. Whether you’re looking for sheds or greenhouses, WhatShed bring you the in depth reviews that can hold the answers to all your questions. 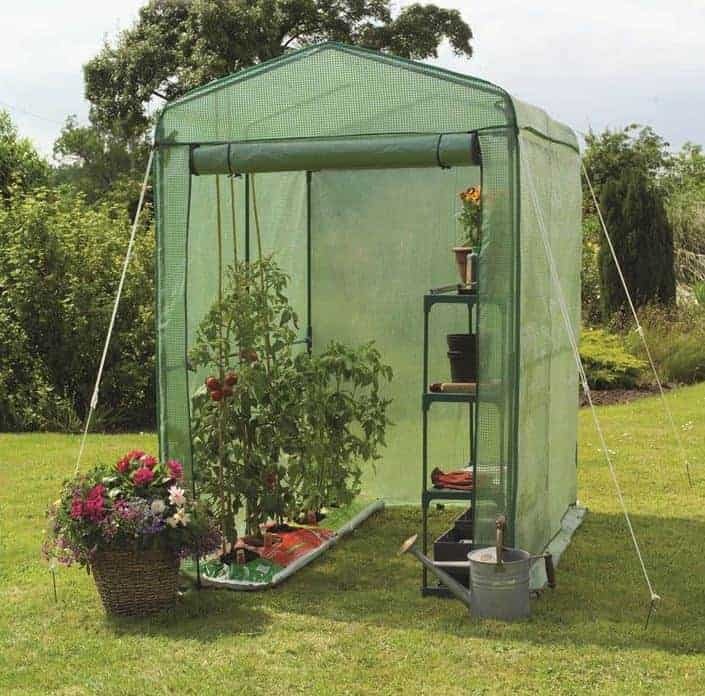 A walk in greenhouse is a perfect accessory for gardeners who have a limited amount of free space in their garden, or who want a protective environment in which to nurture and grow seedlings, and this Gardman model is sure to meet all their needs. It has a compact design which means that it’s both narrower and relatively taller than we usually see; this is shown by its base dimensions of 1.43 x 0.73m, with a generous ridge height of 1.95m. This means that it takes up next to no lawn space, and yet it still provides a lot of growing space. This is helped by the inclusion of five in built shelves, which is greater than we’ve found on any other walk in greenhouses we’ve reviewed. It’s this that gains this the number one spot in our league table. 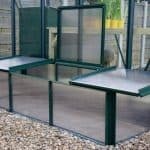 The tall and thin design also made this particular walk in greenhouse one of the most attractive that we’ve seen, resembling a sentry box in shape and with the translucent green PVC cover blending in nicely with a garden background. We are sure you’ll find that the metal tube frame makes this feel very stable when assembled, and we were pleased to see that all guy ropes, fixtures and fittings were included in what we feel is a very reasonable asking price. There are some factors that we see in common across all the high quality walk in greenhouses that we review, clear coverings and a roll up doorway for easy access are two examples. This particular walk in greenhouse however has a unique look all of its own, thanks to an arched rather than apex roof, and it’s also much deeper than we’re used to seeing. These factors make it an even more versatile and useful growing solution, and it also makes it an eye catching addition to any garden. It’s these reasons that see the grow arc take the runner up position in this WhatShed league table. 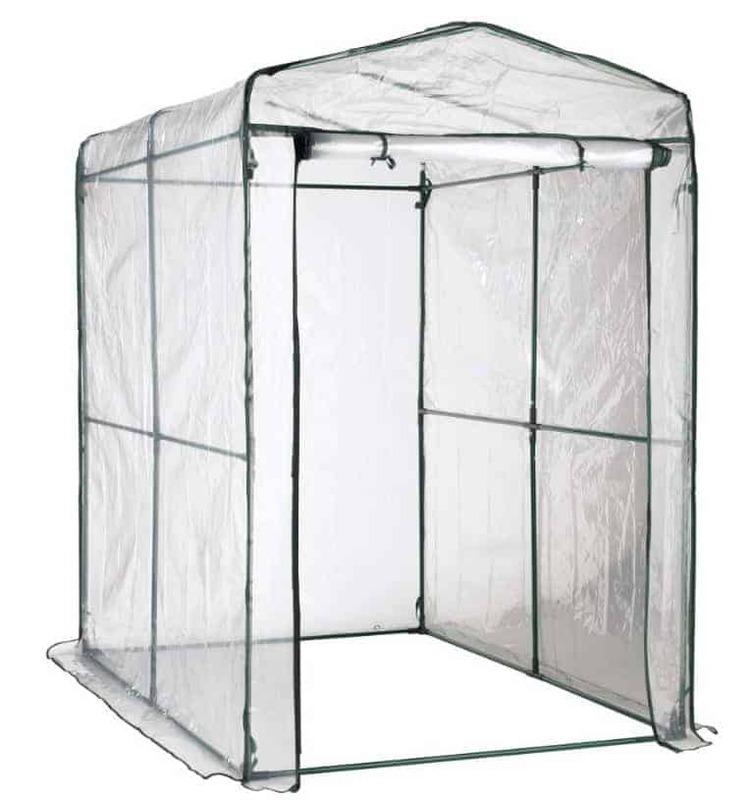 The base width of 1.27m and base depth of 1.90m means that this walk in greenhouse can hold more plants than we’re used to seeing, especially as the peak height of 1.97m also makes this the tallest model that we’ve reviewed. We were also pleased to see that it features two tiers of shelving along one side meaning that it’s ready to use from the moment that the easy installation process is completed. 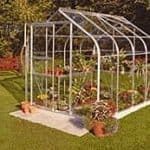 With a price of nearly seventy pounds, this isn’t the cheapest walk in greenhouse we’ve reviewed, but it’s well built and good looking, and therefore we feel it’s also good value for money. When you think of a walk in greenhouse this is probably exactly what comes to mind. It may not be the most elegant garden building in the world, with its clear plastic covering upon a dark metal frame, but it is both tough and very functional. The polyethylene used for the cover should feel lightweight and yet very tough and durable, and it should do a very good job of keeping rainwater out and yet allowing lots of light and heat in. It also represents very good value for money when the amount of growing space is taken into consideration, and it’s this that gains it the third position in our league table. With a width of 1.95m, a depth of 1.20m and a height of 1.80m there’s a lot of interior room for a price tag of just over forty pounds, and so we feel this is ideal for people who are just starting to take an interest in gardening and who don’t yet want to go to the expense of buying a traditional or full size greenhouse. We were pleased to see that guy ropes are included as standard as well, and once it has been pegged into the ground this should be suitable for use even in windy and exposed areas. 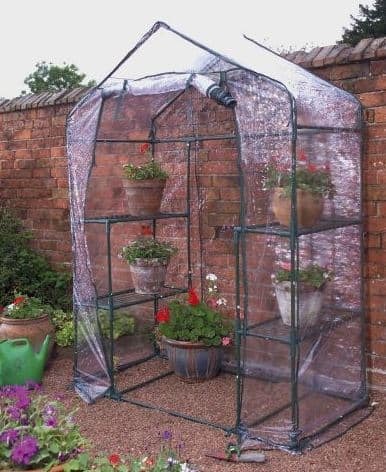 This walk in greenhouse from Kingfisher is a great place to germinate seedlings and encourage the growth of plants whatever the weather, thanks to the weather resistant plastic covering that keeps rain at bay, and yet lets an optimal amount of light in. 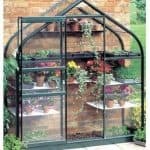 It’s also an ideal plant display unit, as unlike some of the walk in greenhouses we’ve reviewed the covering is completely transparent and so won’t detract from the natural beauty of the plants themselves. With a base area of 1.43 x 0.73m this is very much a mid sized walk in greenhouse, and yet it’s taller than average height of 1.95m still means that it brings a lot of plant growing potential. We particularly liked the way that it has four racks of staging, two down each side, to create a balanced appearance as well as a stable structure. We also liked the way that the roll up door can be zipped securely into place, which comes in particularly useful in windy conditions. What earns it a place in our top five league table, however, more than anything else is the very reasonable price tag of just more than thirty pounds, and if it had boasted a design that was a little more innovative or eye catching then this could have earned an even higher position. This is the second Gardman walk in greenhouse to feature in our WhatShed guide, which shows how durable and reliable we found their products to be. In shape and size this is very different to our table topper, leaving the compact design behind and adopting a design that’s similar to traditional six foot by four foot greenhouses. 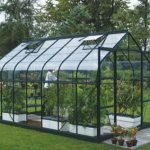 It does bring with it significant advantages over those traditional glass or polycarbonate glazed greenhouses however, in that it’s a lot quicker to install, is lightweight and portable, and of course it’s a lot cheaper to buy. With a base area of 1.90 x 1.25m there’s lots of room for your plants and seedlings inside, and there’s also more than enough room to move around in. This is helped by the ridge height of 1.90m which should mean you won’t have to stoop down when inside this walk in greenhouse. 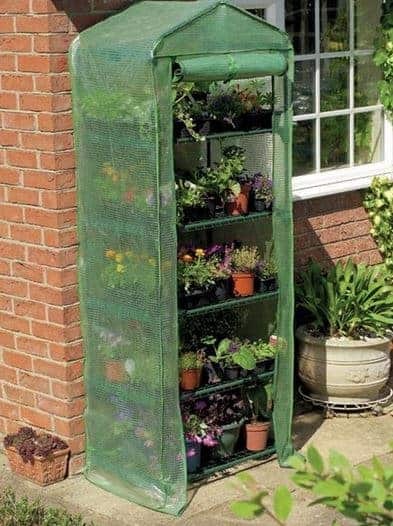 If it had come with more tiers of shelving as well, this could easily have found itself at the upper reaches of our league table, but even though it’s at the foot of this very competitive list we feel it still represents a very good purchase, especially for those with a larger garden, or who want to expand their growing capabilities.